To live brightly, you need to surround yourself with bright colors. Present your portfolio, a small musical or any art site in positive colors. Raise the mood of your readers, and attract always-new audience. 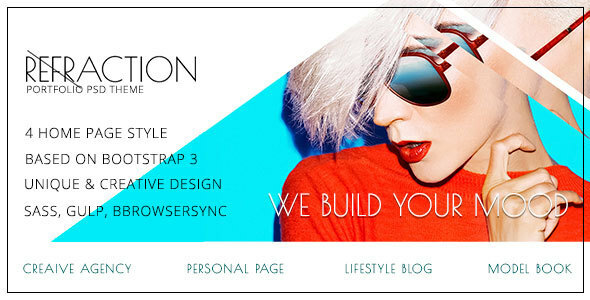 We present you a new Refraction – Creative Agency, Photographer, Personal, Lifestyle, Model HTML Template. Creative, bright, positive pattern – designed especially for those who are looking for new, fresh emotions to represent their personality. This is fashionable and cool template for stylish and modern humans..
Be positive and trendy – and we will create the mood for this.